It begins on the Sunday closest to the Feast of St. Andrew the Apostle (Nov. 30) and spans four Sundays or four weeks unless Christmas falls early. The historical origins of Advent are hard to determine with great precision. From its earliest form in the 4th century, Advent has always been similar to Lent, with an emphasis on prayer and fasting. The Gelasian Sacramentary, traditionally attributed to Pope St. Gelasius I (d. 496), was the first to provide Advent liturgies for five Sundays. Later, Pope St. Gregory I (d. 604) enhanced these liturgies composing prayers, antiphons, readings, and responses. Pope St. Gregory VII (d. 1095) later reduced the number of Sundays in Advent to four. Finally, about the ninth century, the Church designated the first Sunday of Advent as the beginning of the Church’s Liturgical Year. The Catechism stresses the two-fold meaning of this coming : When the Church celebrates the liturgy of Advent each year, she makes present this ancient expectancy of the Messiah, for by sharing in the long preparation for the Saviour’s first coming, the faithful renew their ardent desire for His second coming (No. 524). We REFLECT BACK and are encouraged to celebrate the anniversary of the Lords first coming into this world. 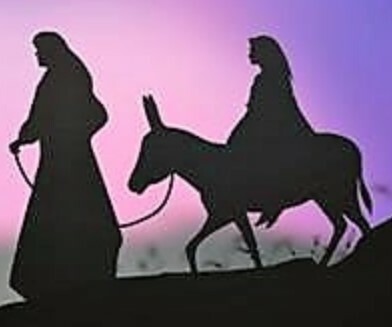 We are invited to ponder more deeply into the great mystery of the incarnation when our Lord humbled Himself, taking on our humanity, and entered our time and space to free us from sin. We LOOK FORWARD as we recall in the Creed that our Lord will come again to judge the living and the dead and that we must be ready to meet Him. Our use of the Advent wreathe was inspired by the German Lutherans in the early 1500’s. The wreathe is a circle, which has no beginning or end: In this way, we call to mind how our lives, here and now, participate in the eternity of Gods plan of salvation and how we hope to share eternal life in the Kingdom of Heaven. The wreathe is made of fresh plant material, because Christ came to give us new life through His passion, death, and resurrection. Three candles are purple (the same colour as the Priest’s vestments in Advent), symbolizing penance, preparation, and sacrifice; the pink candle symbolizes the same but highlights the third Sunday of Advent, Gaudete Sunday, when we rejoice because our preparation is now half-way finished.